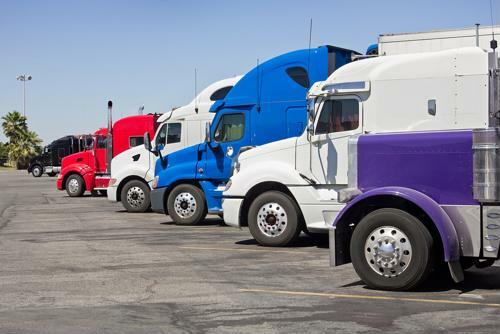 While the average person may sometimes see the struggle to find quick and easy parking spaces in their daily routines as a little bit of a hassle, it's a much bigger issue for professional truck drivers. The fact is that if drivers can't find parking when they need to pull off the road, it's not just an inconvenience, it's a safety concern and a potentially sizable professional hurdle as well. Even with the driver shortage, many professional haulers report having to drive for miles looking for parking before finally just pulling off the side of the road and settling in, according to Fleet Owner. Data from the American Transportation Research Institute suggests that drivers spend about an hour per day searching for a safe parking spot, on average, and that between 4 p.m. and midnight, nearly two-thirds of all drivers on the road have to spend at least 15 minutes on such a search. The fact is that there are about 300,000 truck parking spaces along highways nationwide, but 10 times as many trucks on the road, the report said. More is being done by freight companies, trucker advocacy groups and government agencies to address the issue, but not nearly soon enough. The extent to which this is happening on a daily basis has become quite problematic for pro haulers, according to Freightwaves. A recent industry survey found that a whopping 85 percent of drivers say parking is their No. 1 cause of stress when they're on the job, and 70 percent have had to violate regulations about service time while hunting for parking. Indeed, 96 percent of them say they've ended up having to park in places that weren't specifically designated for tractor trailer parking. All those problems hunting for parking leads drivers to lose about $5,000 in salary annually, because they are taking about an hour of time per day out of what would otherwise been time spent on the road, the report said. Some companies see technology and data that helps drivers more easily locate parking as being a potential solution to the problem. One of the big issues here is that this has long been a recognized stumbling block, and yet little has been done to address it, according to Tim Tyler, director of product marketing for Verizon Connect. A study from the U.S. Department of Transportation noted a lack of available parking for truckers back - in 2002. The fact is that states haven't done much to deal with the issue since then, and in fact many have only closed more of their existing rest stops, further tightening the parking shortage. The more companies can do to invest in solutions that help drivers deal with this issue or otherwise find ways around it, the better off they are likely to be. The truth is that if this is a significant stressor for drivers, any efforts to alleviate those concerns could help boost retention at a time when competition for experienced truckers is fierce.